Description: Designed with round profiles and a clean casual look. 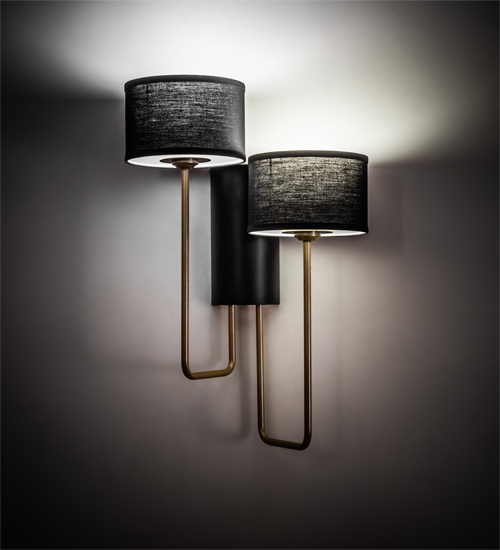 This appealing and versatile wall sconce defines a sophisticated aesthetic. Dual Black Linen shades are designed with Statuario Idalight bottom diffusers and embraced by Champagne Metallic finished arms. The backplate is featured in a Textured Black finish. Handcrafted by highly skilled artisans in our 180,000 square foot manufacturing facility in Yorkville, New York. UL and cUL listed for dry and damp locations however we do not recommend installing it in spaces that experience a large amount of moisture due to the fabric shades.